I may be in the early stages of my trailer build (I don't even have my walls up yet! 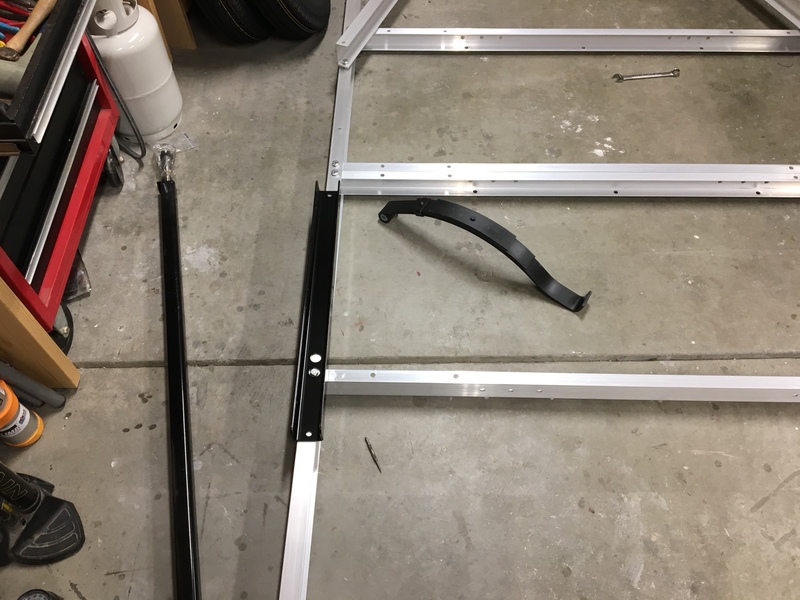 ), but I've been thinking of the axle placement on the Northern Tool 5x8 aluminum frame; I just can't shake thinking that I'll need to move the axle back a few inches. I have a full size spare up front plus I'll be putting a tongue box with 1 or 2 batteries in it to offset the weight of the galley but just in case I do, does anyone have any experience with this? The steel brackets for the leaf springs have pre-drilled holes in them for attaching to the frame plus a couple for clearing the bolt heads. I figure I would have to drill out a couple of holes in the aluminum frame for new attachment points, but would I need to drill any holes in the leaf spring brackets? I would greatly like to avoid that headache. FWIW, on the steel version, I moved thr front hanger rearward about 6 13/16", using the middle cross piece hole for the forward bolt and drilled a new rearward hole. For the rear hanger I moved it 6" ,using rear hole for forward bolt and drilling new rear hole and using it for both rear hanger hole and cross brace. I avoided drilling new holes in the hangers for the cross brace bolt heads. I also flipped the axle to lower it about 2 5/16", but did not flip the "U" shaped axle, to prevent accumulation. Instead drilled part depth holes in the solid steel bars to accommodate the "studs" f the spring bolts. IIRC the axles, springs, and hangers of the aluminum and steel are very similar. Would love to see pictures of your work.